In my 2018 post, I wrote that I was starting a study of weft-faced pattern weaves following the book 'Tabby to Taqueté' by Nancy Hoskins. This book is a series of 53 lessons with a technique sampler accompanying each lesson. Sampler I is completed and I will share that later in the post. But first, what is weft-faced weaving? In weft-faced weaving, the warp is completely hidden by the weft. The warp acts as the scaffold while the design or pattern is built by the weft. This is different from balanced weaves, where both the warp and weft appear equally in the fabric. Let me illustrate. Above, is an example of a balanced weave. Both the warp (purple, green, blue threads) and the weft (white threads) can be seen. This weave structure uses the colors of both the warp and weft to create the pattern. This, on the other hand, is a weft-faced weave. The underlying cotton warp is there only for scaffolding. The design develops from the rows of weft threads. Here is another example of a weft-faced weave demonstrated in my Swedish Art Weave project. You can also have a warp-faced weave. Just as the name implies, the warp is emphasized and the weft is not seen. Above is a band I wove for my Swedish Art Weave bag. You see the pattern comes from the various colors in the warp, whereas the weft is essentially hidden. If you look closely at the above photos, you may notice differences in the sett, or number of threads per inch, in each of the structures. In weft-faced, the warp threads are spread further apart, allowing the weft to pack in tighter and cover the warp. Just the opposite in warp-faced, where the warp threads are sett very tightly. And in balanced weave, the warp and weft threads are basically the same number per inch. Generally, weft-faced fabrics are thick and dense. They are ideal for household textiles such as rugs, runners, coverlets and pillows, as well as outerwear. They are heavier and will not have the same drape as a balanced weave fabric; so you probably wouldn’t choose this structure for a scarf or shawl. Weft-faced weaving is used in tapestry techniques, in rug making, and in weft-faced pattern weaves, often termed boundweave. Boundweave is a general term and includes many techniques such as Krokbragd, Flesberg, Rosenbrogd, Rosepath, Treskaft, and others. Boundweave variations can be woven with two or multiple shafts. The more shafts, the more details you can weave in a figure or motif. In 'Tabby to Taquete', Nancy Hoskins includes Samplers using 2, 3, 4, 5, 6, 7, 8, 10, 15, and 16-shaft drafts. Because each pick may be a different color, endless designs and great detail are possible. Krokbragd is one form of boundweave; generally threaded as a 3-shaft Point Twill. 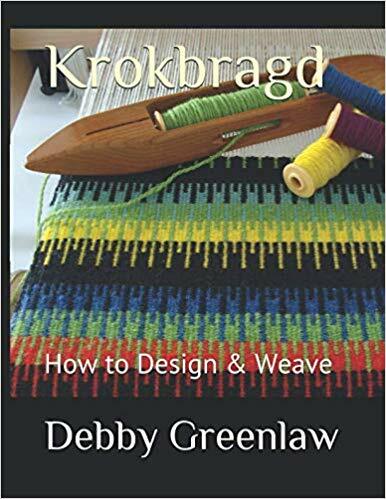 In my research and preparation for the book I am writing, 'Krokbragd: How to Design & Weave", I wanted to hone my skills, thus my study of weft-faced pattern weaves. So, on to Sampler I - Plain Weave . . .
Weft-faced patterns take multiple weft picks to weave a complete row. The pattern is created by picks of different weft colors covering different warp threads; each row building bits, cubes, columns, and blocks of color. An important consideration is the choice of color value (light versus dark). The contrast of colors creates the effect of the pattern and background. For my sampler, I used two strands of Borgs Vävgarner Faro wool yarn in three colors: 'Unbleached' for background, 'Spring Green' for accent, and 'Asparagus' for outline (dark borders between patterns). For warp, I chose 8/4 cotton. A 1/2 inch plain weave heading is woven at each end and finished with knotting stitches. There are many weft color changes in this type of weaving. Nancy recommends only carrying a color on the back for a few passes. One of the skills I'm working on with this study is color management at the selvedges. I can see definite improvement with just this first sampler; not mastery, but definite improvement. Nancy herself says, "controlling the selvage color is probably more difficult on this first sampler than on any of the others, because we are making so many color changes on the single pass designs". Since this is a plain weave draft (2-shafts), only simple patterns can be woven. However, even with this limitation, a surprising number of designs can be created. The pattern motifs above (left to right): color profile, 'pick and pick' (picket fence), 'pick and pick' edged with lines (resembles an embroidery stitch know as a guilloche), 'pick and pick' edged with a band of color, white 'pick and pick' framed by a dark background, and a band of color through the center of 'pick and pick'. Between each motif, a set of passes in the background color (white) is woven, followed by a set of passes of outline color (dark green), and then another set of passes in the background color. Continuing left to right (note first pattern is last one from previous photo): cubes of 'pick and pick', dot (spot or bead), multiple dots, line, multiple lines, line and dot, and chain. And finally, the last 2 patterns on the right are an all--over dot pattern and a larger area of pattern. Nancy suggests using a four-shaft twill draft so that you can continue on to Samplers II, III, IV, and V without the need to rewarp the loom or change the threading. Great idea! My warp is 93 ends and long enough to accommodate the first five samplers. Ready for Sampler II . . . I'll end this post with a photo of my second knitting project - a waffle stitch cowl. This stuff is addicting!!! !